One hundred years after the birth of Alan Turing, the great pioneer of computer science, artificial intelligence has become so much a part of everyday life that it is hard to imagine the world without it. 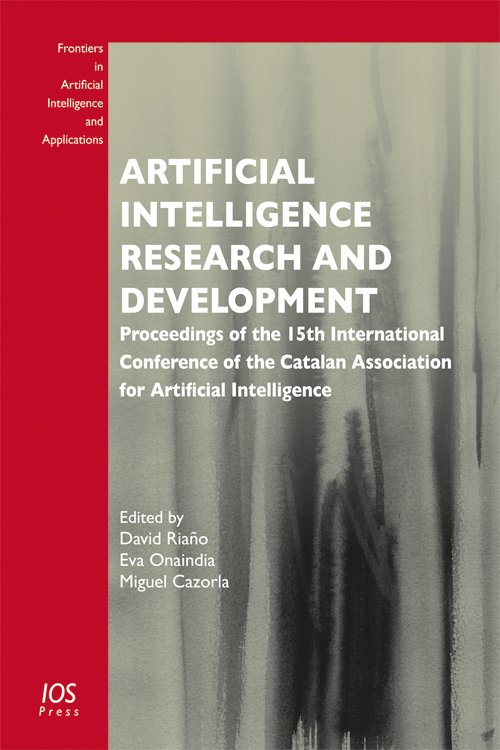 This book contains papers from the 15th International Conference of the Catalan Association of Artificial Intelligence (CCIA 2012), held at the Universitat d’Alicant, Spain, in October 2012. Since 1994 the Catalan Association of Artificial Intelligence (ACIA) has fostered cooperation between researchers in artificial intelligence within the Catalan speaking community. The annual CCIA is its international conference, a platform where not only researchers from Catalan speaking countries, but also those working in artificial intelligence worldwide, have found a place to show, discuss and publish the results of their researches and developments. The 23 papers presented here, which include contributions from the AI community all over the world, cover topics such as KDD, DM and machine learning; natural language processing and recommenders; computer vision; robotics; AI for optimization problems and AI applications in the real world. The book also includes the contributions of the two invited keynote speakers at the conference - Oscar Cordón and Eduardo Nebot - which respectively address the subjects of real-world applications of soft artificial intelligence, and challenges of automation and safety in field robotics.